Father and daughter team of Charlie Haddock and Elishia Townsend are taking their passion for floral design and more to a new level with their new business Simple Elegance of Maine Florist, an online florist that provides one of a kind creations, wedding floral designs, and every day floral needs, delivered. “I know exactly what to do. If I’m going to work that hard, I’m going to keep it in my family,” said Townsend, who worked at shops in Bangor and Hermon before starting her own business here. So far her sister-in-law, Haddock’s two grandchildren and a sister have helped with some of what they have done. “It’s a family affair,” Townsend said. Haddock, the former Windham Middle School principal has been interested in floral design for 15 years, when he did the flowers for his daughter’s wedding. This is his third career. He was a builder for 20 years, then at WMS for 22 years and now he is ready to tackle this new venture. “I’ve always been interested in this,” he said. Townsend has been doing wedding arrangements since 2009. She has a Maine Masters in floral designs and has worked in floral shops before. Simple Elegance doesn’t have a storefront at this time. Eventually they would like that, but for now they are able to service Cumberland County, Raymond to Cape Elizabeth, Standish to the coast with regular floral delivery service, including sympathy bouquets for funerals. “We don’t do cookie cutter arrangements. We want to use our own designs,” Townsend said. They are not affiliated with any of the National floral companies. They feel this makes them more trendy and up to date. “We are local independent shop, support local,” she said. 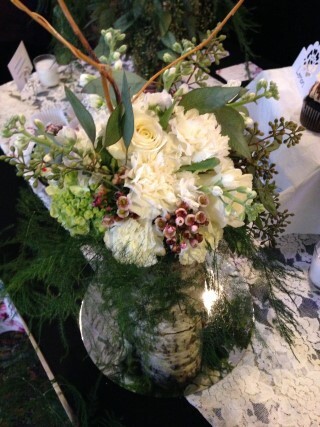 They also do wedding floral design statewide and into New Hampshire. As an additional benefit for brides, Simple Elegance also offers wedding cakes and cupcakes. For those who like one stop shopping, they have paired with Jessica Tardiff Photography, to offer a bundle featuring, five hours of wedding coverage, two photographers, a print package and a bridal assistant ($2,800 value), bridal bouquet, up to four bridesmaids, groom, up to four groomsmen, up to four corsages, toss bouquet, up to 10 centerpieces and wedding cake or cupcakes for up to 100 people ($1,800 value). The combination price is $4,000. On the Simple Elegance website are some of the designs offered, but they try to customize the arrangements, whenever they can. Calling when requesting changes to a design is best according to Townsend and Haddock, otherwise, orders can be placed on the website. Orders placed by noon Monday through Saturday, will be delivered in the afternoon and evening. The only exception is funeral arrangements and Valentine’s Day, although Haddock recommends that roses be delivered to the office of your love on Thursday or Friday, rather than waiting for the weekend. Their opening Valentine’s Day special is a dozen long stemmed arranged roses is $74.95. There is a $6.95 delivery change for Windham locations and a $12.95 charge outside of Windham. Those from Peaks Island or Frye Island should call to arrange for flower delivery and discuss delivery options. 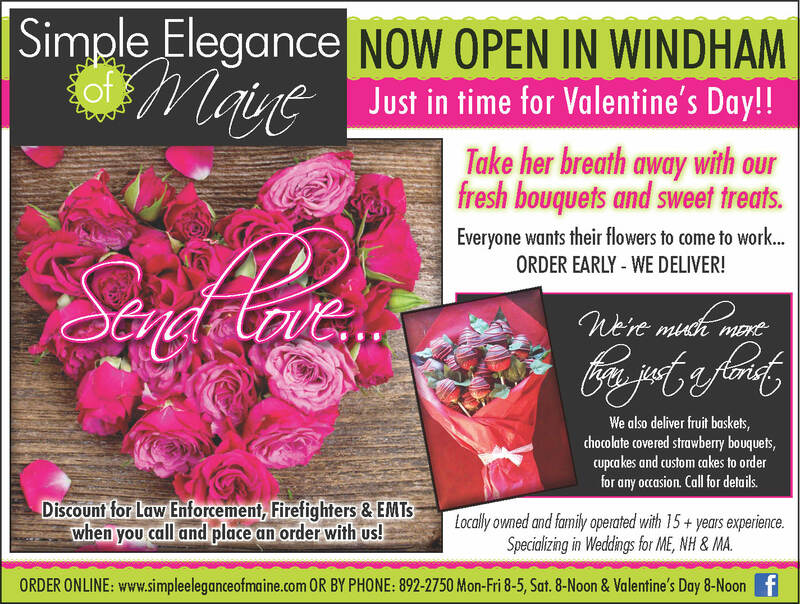 Simple Elegance will be open on Valentine’s Day until noon. When it comes to funeral work, Simple Elegance prefers to sit with the family to make the experience as meaningful as possible. They will travel to the family’s home or to the church or chapel as need. It’s the little things that make Simple Elegance stand out like custom made wooden vases and their attention to detail when it comes to pleasing the customers. 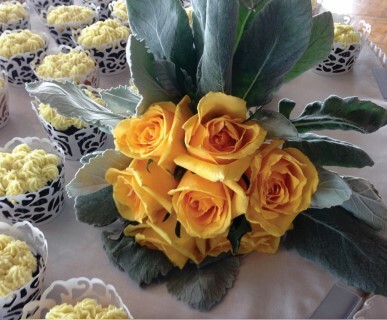 When it comes to special occasions it helps to plan ahead and order flowers before the rush. Simple Elegance is also proud to offer chocolate covered strawberries, just in time for Valentine’s Day, and gourmet fruit baskets filled with a variety of fresh fruit. Add an order of chocolate covered strawberries onto a delivery of flowers to step up any gift. 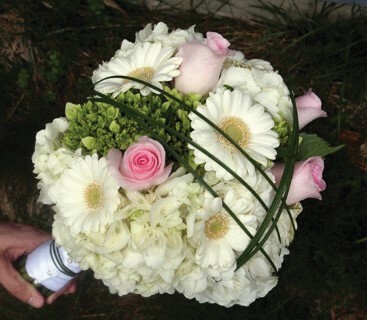 What makes Simple Elegance of Maine Florist different? “It’s the passion we have for the business,” Haddock said. They are working to get more of the family involved including planting Christmas trees. “It’s something to pass down to the kids and grandkids,” he added. They do business events and decorate for the seasons, especially Christmas. They are available to offer baskets for staff appreciation or gift baskets for employees. Simple Elegance also delivers to hospitals and nursing homes in the area. Call to find out about discounts for law enforcement, firefighters and EMTs. For more about Simple Elegance, visit www.simpleeleganceofmaine.com or with special needs, orders or questions, call 892-2750. For wedding plans and cakes, call 561-0907. So pretty! I really like the beautiful flowers. Different types of flowers are used for expressing different emotions. If you want to send flowers to the Philippines, then You can easily choose to go for online Flower delivery Philippines. Yellow flowers decorated very beautiful . Different colors of flowers are used for every occasions. Every color of flower shows for different feelings.